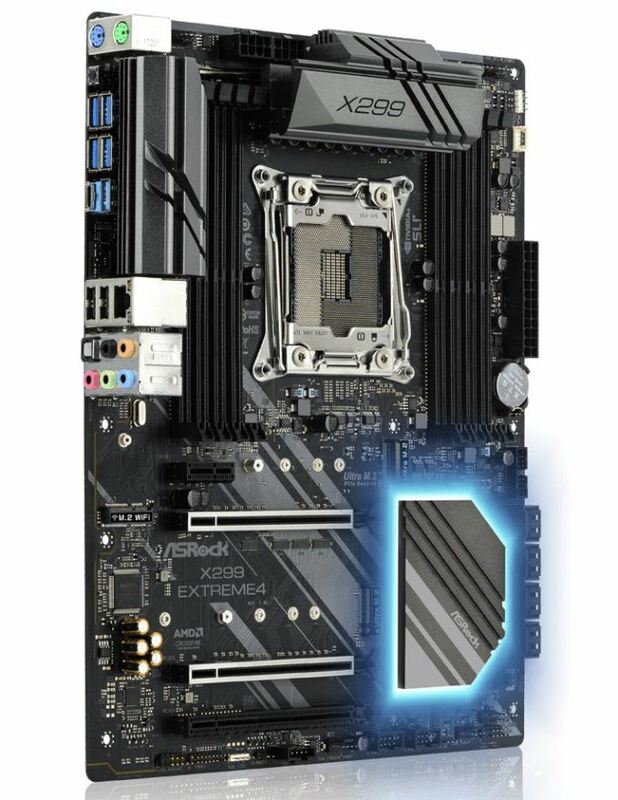 The ASRock X299 Extreme 4 is an entry-level motherboard from ASRock designed to give users an inexpensive step into the premium land of the high-end desktop. At $200, it is the least expensive X299 motherboard we have tested, but still has a plethora of features including USB 3.1 ports, dual M.2 slots, premium audio, as well as SLI and Crossfire support. The mid-range feature set on an entry-level board makes for an intriguing selection. ASRock has used the Extreme line in their motherboards almost as far as I can remember. The lineup usually starts with an Extreme3 and ends with Extreme9 (or Extreme11 for some special products). The Extreme3 and Extreme4 boards have always been reserved for the entry level, attempting to offer a feature set found on more expensive boards from the competition. Many users (and reviewers) have called the Extreme4 one of the better 'bang for your buck' motherboards available. The ASRock X299 Extreme4 is aiming high. It has large dual heatsinks to keep an 11-phase power delivery cool, dual M.2 slots both able to work at PCIe x4 speeds, SLI/Crossfire support, and USB 3.1 ports on the rear panel. While it may not have some of the added extras from the mid-range price segment (three M.2 slots, three-way GPU, front panel USB 3.1), it has enough of the major features to merit a good entry into the platform. Our performance results show the Extreme4 is a competitor in all the tests, landing in the middle in just about everything we normally throw at it. 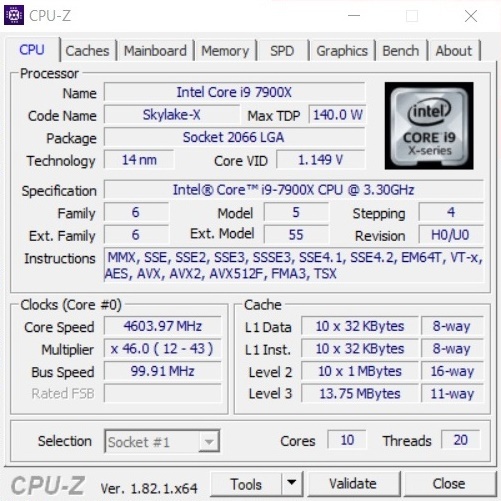 ASRock's Multi-Core Enhancement seems to match the majority of boards we have tested, and is the reason the results we have are all around the top of that bell curve. The X299 Extreme4 boosted all cores to 3.6 GHz in any multithreaded test, and 4 GHz in single threaded ones. Our gaming results were fine as well, with this Ex4 showing out in ROTR with the most FPS yet, while the AOTSe testing showed an average result in 1080p, but for some reason was the slowest at 4K UHD, but by a small margin. Our overclocking adventures when smooth overall, with the board being able to handle our CPU at 4.6 GHz without worry. 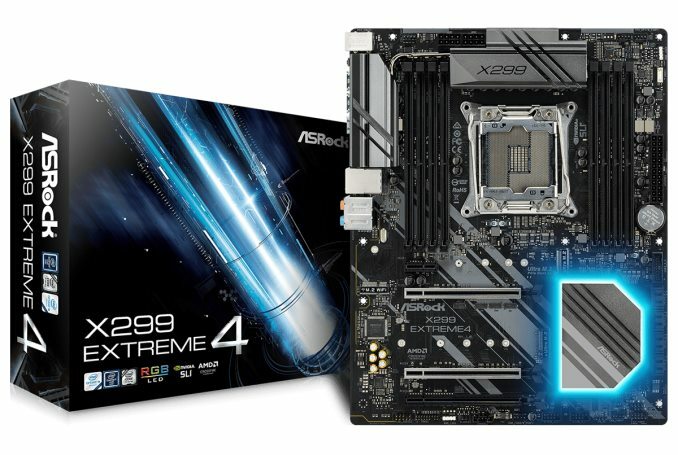 The ASRock X299 Extreme4 is currently priced at $200 from Newegg and at the time of this writing. In this price range, its direct competitors are the MSI X299 Raider at $210 and the Gigabyte X299 AORUS Gaming at $210, both also from Newegg. All boards have their pluses and minuses but one big difference is the AORUS Gaming only supports the quad-core Kaby Lake processors only while the others support the full range of both Skylake-X and Kaby Lake-X processors. Otherwise, the biggest differences between these boards come from RAM speeds/capacity, USB port type and number, as well as PCIe slot count among other minor differences. Historically, ASRock doesn't push the super-high price ranges that the other three motherboard manufacturers do, preferring to sit lower in the market at both the low and high prices in its stack. For high-end desktop platforms, this usually means they are the cheapest, and we see the motherboards for X299 from ASRock range from $200 up to around $400, or $423 for the XE version of the Professional Gaming i9. Board partners have launched dozens of motherboards on this platform already, several of which we will have an opportunity to look over in the coming weeks and months.